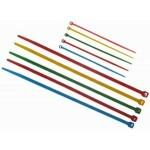 COLOUR CABLE TIES. Buy quality Auto and Marine Electric Parts and Accessories online, Sydney. CT-100B-2C BLUE cable ties 100mm x 2.5mm Supplied: Bag of 100 pieces..
CT-100G-2CGREEN cable ties 100mm x 2.5mm Supplied: Bag of 100 pieces..
CT-100P-2CPINK cable ties 100mm x 2.5mm Supplied: Bag of 100 pieces..
CT-100R-2CRED cable ties 100mm x 2.5mm Supplied: Bag of 100 pieces..
CT-100Y-2CYELLOW cable ties 100mm x 2.5mm Supplied: Bag of 100 pieces..
CT-200B-4CBLUE cable ties 200mm x 4.8mm Supplied: Bag of 100 pieces..
CT-200G-4CGREEN cable ties 200mm x 4.8mm Supplied: Bag of 100 pieces..
CT-200P-4CPINK cable ties 200mm x 4.8mm Supplied: Bag of 100 pieces..
CT-200R-4CRED cable ties 200mm x 4.8mm Supplied: Bag of 100 pieces..
CT-200Y-4CYELLOW cable ties 200mm x 4.8mm Supplied: Bag of 100 pieces..